To anyone fascinated by the work of Alexander and Euphemia Ritchie, the makers marks and hallmarks can be almost as intriguing as the wonderful craftwork itself. From the outset in the last decade of the 19th century, Alexander Ritchie signed his craftwork pieces, including those carved in wood, with his initials AR. Much of his early copper and brassware is unsigned, but his style is so unique that it can be recognised by anyone who has studied his work carefully. With regard to silverware all items were marked, but in various different formats. The earliest Iona silver items of Alexander Ritchie date from the first decade of the 20th century, and most bear a double mark of AR IONA impressed into separate rectangles, and a further mark of CS & FS. (The ‘&’ is sometimes replaced by a star). This was prior to 1910, when the firm of Cornelius Saunders and Francis Shepherd submitted Alexander Ritchie’s silverwork. Above is an example from a silver spoon hallmarked Chester 1907. 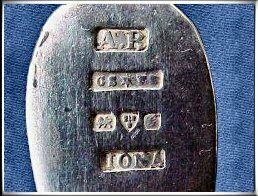 Alexander Ritchie’s own mark was registered with the Chester assay office in 1910, and from this date pieces carry the AR IONA mark with the initials AR often being stamped a second time next to the hallmark. Records from Glasgow are sketchier, as this assay office closed in 1964, but pieces are known as early as 1911 and through to the early 1930s. Another early mark favoured by Ritchie was the ‘hour glass’ or ‘spectacles’ mark, consisting of two adjoining circles containing the letters AR. An example of this type of mark is shown below, and is from a St Martin’s cross dated Glasgow 1911. This cross also has a second small stamp of A.R IONA set within a rectangle on its side, and is shown in the picture on the right. During the early part of the 20th century, many items of silverwork were not hallmarked, and just carried the stamps AR and IONA impressed into separate rectangles. Larger silver jewellery items such as annular (ring) brooches and penannular (ring brooches ending with two terminals, reminiscent of ancient Celtic jewellery such as the Irish Tara Brooch) – carried more exotic and larger high-relief initials of AR, AER, and occasionally ER. The example below is from a ring brooch, the front of which shows a scrolled vine-leaf decoration taken from medieval stonecarvings on Iona. 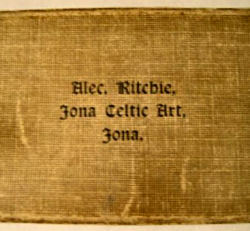 In 1931 The Ritchies established their trading stamp of ICA or Iona Celtic Art (the actual use of ‘Iona Celtic Art’ as a business name was begun by Alexander in 1910 but was not stamped on silver items until the early 1930s). The ICA mark was continued until their death in 1941 (see the ‘Brief History’ section on this site). 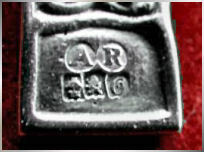 Earlier ICA marks were stamped within a rectangle – later in the 1930s the letters were stamped directly onto the surface of the silver, as were the initials AR. The example below is from a ring brooch of 1937, the front of which carries the legendary medieval-style letter ‘M’ as a design. This soon became know as the ‘marriage brooch’, and was often given as a betrothal gift. The ICA marks in the second picture below are from a large 1936 penannular brooch. Birmingham hallmarks of the Ritchies’ work began in 1931 in conjunction with the ICA mark, and continued through until 1941. Ritchie had some of his pieces made through the Birmingham silver company Darby and Sons. A few ‘hybrid’ pieces exist with his AR IONA mark, and the additional marks D&S (for W.H.Darby and Sons). During the 1920s a method of registered numbers was used for several years by the Ritchies on their silverwork, but this sems to have been found unsatisfactory as it was discontinued in favour of a full set of British hallmarks. 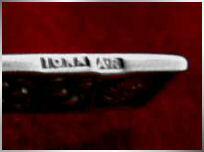 The example above shows a 6 digit Ritchie registered number (stamped on the item as Rd No) from the reverse of a penannular brooch, along with the AR and IONA marks. 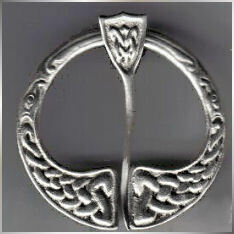 An additional and unusual maker's mark was produced on some silver items between 1941 (Alexander Ritchie's death) and 1945 when the CAI (Celtic Art Industries) mark began. 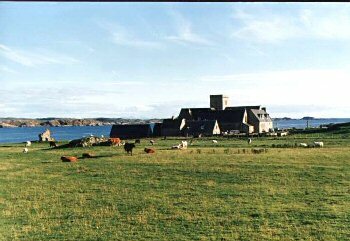 This was HHI IONA, being the mark of Highland Home Industries, a business whose small crafts shop was based on Iona and was run by Hannah MacCormick, mother of Iain MacCormick (see section on Later Silverwork on this site). Alexander Ritchie passed many of his original designs on to the MacCormicks. Iain, who learnt his trade from Alexander as a boy, continued many of these for several decades. HHI IONA silver items have an Edinburgh assay mark. This assay office was never used by Alexander Ritchie. Below is an example of an HHI IONA mark with an Edinburgh hallmark for 1944, on the base of a St Martin's cross pendant.. 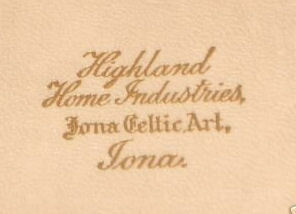 Here is another example of Edinburgh hallmarks from the reverse of Highland Home Industries Iona spoon of the early 1940s. Very occasionally Alexander Ritchie items survive in the original Iona boxes that they were supplied in. These are rarely seen and the calligraphy is very striking. Here is an original and well-preserved one, at present in Israel with its owner - an example of how far and wide Ritchie's work travelled! This box below contains a 1931 hallmarked Silver Nunnery spoon in its original tissue wrapping. You can see one of these spoons on this website - the box itself is a rarity. For a few years immediately after Alexander Ritchie's death, Highland Home Industries on Iona continued producing Ritchie's work from his original moulds, and marketing some items in their own Iona Celtic Art boxes. Again, not many of these boxes survive, but their design was executed in gold print, and looked very impressive. This particular box dates from 1946 and contains a set of hallmarked silver spoons. It is possible now that many people are fascinated and inspired by the Ritchies' work, that further versions of the legendary AR and AER marks will be seen. We are always interested to hear from folk worldwide about their interesting pieces of Iona silverwork, and as new or different information comes in we will update the site accordingly. You can always email us at alexander.ritchie.iona@gmail.com with any interesting information or pictures.